The latest figures released by the Government show that children with autism in North Yorkshire are continuing to significantly underperform compared to the majority of children in other local authorities in England. In the last two academic years statistics show North Yorkshire has finished bottom in two subject areas, and second to bottom in another. There are 151 local authorities in total. Other data recently released shows that the attainment gap between children with special education needs and those without in North Yorkshire has worsened and is well below the national average. 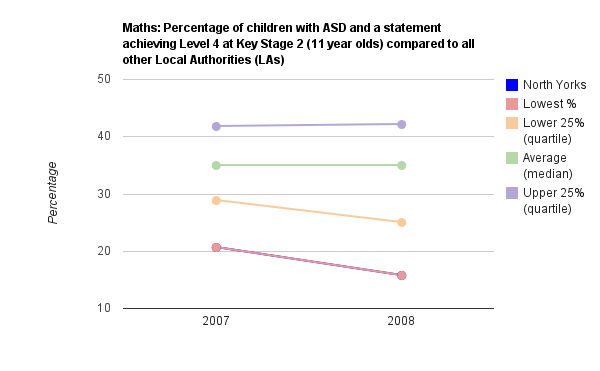 The Government has published a whole range of data for children with special educational needs, including figures for children with autism with a statement of special educational needs (SEN) achieving at least level 4 at Key Stage 2 (mainly 11 year olds) across four subject areas: Maths, English & Maths, English and Science. In not one subject area over the last two years, for which data is available, have children from North Yorkshire achieved even the national average. The Government does not publish data where the numbers are so small individual pupils may be identified. That means we don't have all the data in all the categories for North Yorkshire, and it makes comparing how children who have a diagnosis of autism on School Action Plus perform impossible. Data for children with a diagnosis on School Action are not collected. The upper and lower quartiles give an indication of how spread out the data is. Each quartile contains 25% of local authority results. The percentile rank indicates how well North Yorkshire does compared to other local authorities eg if the percentile rank is 70%, that means 70% of local authorities performed less well, and 30% performed better. North Yorkshire and Lowest % are the same - children in North Yorks achieved the lowest published percentage for any authority. 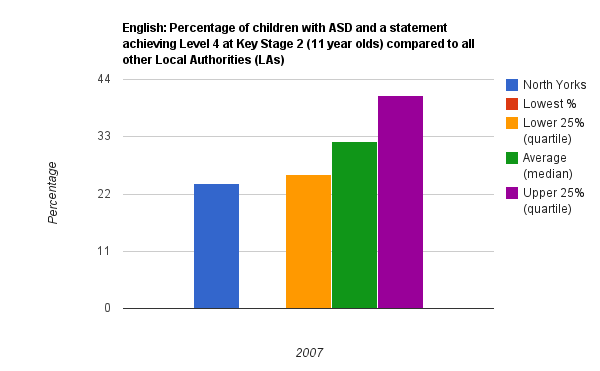 Sources here (Theme 2) and here (Theme 2) No data for English in 2008 for North Yorkshire has been published. What the data does show is that for the last year figures are available (2008-09), in Maths, North Yorkshire had the lowest recorded score of any local authority (15.8%) and the second to lowest score in Science (23.7%). For the other two categories, English & Maths and English, data is not available. Caveat: as there are only two years of data, including some gaps, we must be cautious about inferences. The numbers of children these statistics are based on is small - making the results less predictable. We don't have enough years of data to plot meaningful trends. The figures also look at all other types of Special Educational Needs, and produce an average attainment figure across all SEN. Simply looking at that figure in North Yorkshire compared to the national average masks the autism figures because North Yorkshire does better than the average in other categories of SEN. North Yorkshire County Council issued a press release about the figures highlighting the improvements relating to school exclusions and pupil referral units rather than performance of pupils at Key Stage 2. Figures for Key Stage 4 were also published, but have not been analysed.